Including neighborhoods like Casa Solana and boasting a wide variety of housing styles that will fit homebuyers’ various budgets, the northwestern section of Santa Fe, New Mexico, is an excellent place to call home. Boasting a convenient location, gorgeous natural beauty, and fantastic residences, this area has a lot to offer. Regardless of your interests, you will not struggle to find enjoyable activities to fill your free time when you choose to live in this area. Furthermore, available properties in Santa Fe Northwest include single-family homes and condos, so you are sure to find something that suits your style. Homes for sale in Santa Fe Northwest are ready to impress you, so now is the time to consider what it would be like to live in this area. When you choose to live in this area, you will have plentiful entertainment opportunities at your fingertips. For example, you will have easy access to everything that the dynamic Santa Fe metropolitan area has to offer. Whether you are exploring the Plaza, attending an enthralling live performance, taking part in a local festival, or enjoying the city’s status as an arts hub by touring an interesting museum or impressive art gallery, you will be thankful for the location of your Santa Fe Northwest single-family home or condo. When you are ready to spend time outdoors soaking in the warm sunshine, you will also appreciate the proximity of pleasant parks and natural areas. Invigorating hikes, exhilarating bike rides, relaxing strolls, and picnic lunches with wondrous views can become part of your everyday life when you are a resident of this area. No matter where your adventures lead you, you will be content to think of your Santa Fe Northwest single-family home or condo awaiting your return. An excellent location, beautiful residences, and ample entertainment opportunities are only a few examples of what you will enjoy about living in this area. 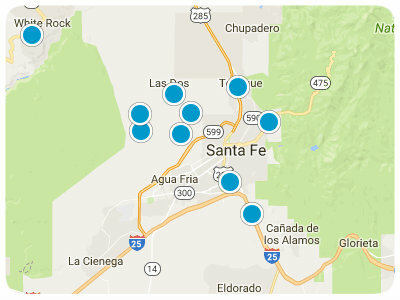 Santa Fe Northwest real estate options are ready to pique your interest. If you are ready for more information regarding homes and condos for sale in Santa Fe Northwest, please do not hesitate to contact us.